I’m more or less assuming all of us are familiar with the Apple Lisa, Apple’s and Steve Jobs’ first attempt at turning Xerox PARC’s work into a marketable product. It was a flop, but many of its ideas carried over onto the Macintosh, and in fact, Macintosh development took place on the Lisa. Due to the fact few Lisas were sold, it’s hard to get your hands on a working model, meaning most of us will never get the opportunity to actually use one. Luckily, there’s a very advanced Lisa emulator available, written by Ray Arachelian. It’s open source (GPL) and available for Windows, Linux, and Mac OS X. Setting it up is remarkably easy (there are non-hqx Lisa operating system files too), but do note that technically, you need to own a Lisa yourself in order to use the ROMs. But, of course you do. The Lisa user interface takes a bit of time to get used to, as its terminology is a bit alien, and some things feel quite a bit arbitrary from our modern, harmonised perspective. For instance, it took me a while to figure out how to open a new file in the Lisa office applications; it turns out that you need to double-click a special kind of icon (‘stationary’), which the Lisa calls ‘tear off stationary’, which creates what to me looks like a copy of said stationary icon. This icon is the actual new file; double-click it to open it. I’m having quite some fun poking around the Lisa, and the emulator has been holding up perfectly – no crashes, and it’s remarkably easy to use. I would definitely advise giving this a go if you have some spare time. 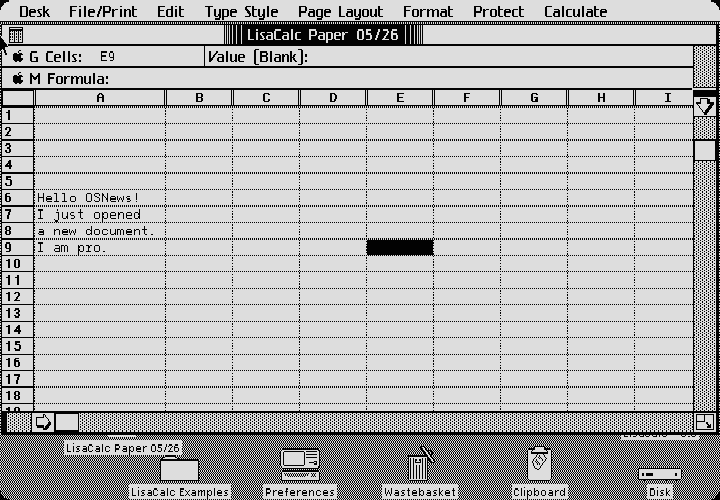 I’d love to replace it with a nice brand new HTML5/js site that itself looks like the Lisa Office System GUI. If you’d like to volunteer to code it up, I’d happily replace the current website with it. The background with that color text. I had to highlight the text in order to read it. I’m not complaining about how the site is laid out. It’s just illegible. With the increasing scarcity of intact and working vintage machines, and the impracticalities of acquiring and storing bulky heavy electronics, I wouldn’t mind seeing more stories like this on OS News. Pity the emulator background image is a dirty, yellowed Lisa 2. I would have preferred a pristine original Lisa. The emulator screen looks chunky on a Retina Mac. You have to switch to native resolution for it to look normal. Setting “Display” at “Double Y” with “Turn Skins Off” seems to look best on Retina Mac. Thanks, keep in mind it was made from one of my own actual Lisas, which is sadly yellowed. Feel free to download the source and look inside the resources and whiten them if you’d like. You’re the writer of the emulator? Nice work. I’ve just noticed, with “Double Y” set, the pointer stops around 3/4 of the way down the screen. Is that a bug? Is there a way to speed up the pointer movement? It seems a bit laggy. Otherwise, it seems to work fine. That sounds like a bug. You can change the throttle to speed up the emulated CPU, that might help with the speed. Yes, I wrote Lisaem between 1998-2007, there was no retina Mac back then. I’m on a 17″ MacBook Pro now, and I’m unlikely to buy a retina macbook pro – they have no, or very few, user replaceable parts, and the soldered on RAM is just anathema me. Plus you can’t order them with matte screens anymore. I like shiny and pretty as much as the next guy, but screen glare = headache. I prefer machines that I can upgrade myself. The current crop of apple wares is high cost, and highly on the built-in-obsolesence bandwagon that goes straight to the landfill. There’s a CPU bug with an unhandled NMI exception or address error, I forget which, so LisaEm can’t link binaries for some reason. There’s a lot of bugs. Well that explains a lot. Doh! Guess it’s time to go pulling apart the LisaEm sourcecode to try and fix You should Github this? I’m attempting to fix it, well, on and off, mostly off. Couldn’t find the bug manually, the next steps are to build a CPU comparator and compare LisaEm’s generator core against other emulators and see what they do, opcode for opcode – I highly suspect there are a few CPU bugs. You can see one in the desktop scroll bar, one of the scroll arrows is in the wrong place. Another is visible in the Desktop menu – it shows duplicate entries. Yeah, github sounds like a good idea. The latest version is 1.3.0, but isn’t functional – had a lot of “fun” when OS X went to 64 bit with wxWidgets, but those bugs are fixed, so what’s left are my CPU core bugs. you talk about stationary, it is like the stationery that we still use on mac by checking it on with CMD-I on a file ? Unlike other GUIs, the LOS has the concept of Stationary as an infinite source of paper. You don’t run LisaWrite or LisaList to launch a word processor or spreadsheet. Instead, you clone the stationary into a new document, and you get to name it. When you double click on that document, then LisaWrite (or whatever app) will launch and you get to do the work. There’s no “save” command, your work is saved automatically, and if you shut down the Lisa or restart it, your documents will open where you left them off. Much nicer than what followed in the 1980s. Also, if you duplicate a document, you’ll get two identical documents with the same exact name. Excellent work (despites any bugs lurking in the background). Another project motivated only by curiousity and individual fulfillment rather than monetary gains. Also, it seems that your web site was focused on content rather than eye-candy. This would be a rarity nowadays. I can see one highly valuable use of such an emulator – even if one does not quite have a dead machine with the necessary ROM license. It is the possibility to extract old information from discovered hidden. How about an unpublished game or novel? How about the sequential suite of edits of a music score? How about the correspondance between two authors? Up to 50 years ago, all that raw information about the creative process of an individual was on paper and could be found – unless destroyed by unlikely circumstances. Nowedays, it still exists albeit in a format which could never be readable again once all the machines capable of doing so die! 1.2.6 is “ROMless” – you don’t need a ROM if you want to run LOS or LPW. The emulator internally handles a lot of the ROM subroutines that are needed to start these operating systems. Interesting comment. Those who argue that Apple simply embellished the PARC GUI to create the Mac would, if confronted with an actual PARC machine, be very lost because almost nothing would work like the modern GUI they are accustomed to using. PARC invented the alphabet of the modern GUI but Apple invented the grammar, and that grammar is what all modern PC operating systems were based upon. The Lisa already had some of that modern GIU grammar but big chunks of it still consisted of just the PARC alphabet. Interesting comment, as the jump from PARC to Apple is WAY larger than the step from PalmOS to iOS – yet people like you insist iOS is a massive huge mega step forward. Switching UI metaphors is a bit more substantial :o). I don’t agree with the metaphor; PARC invented one of the grammars, and Apple composed some of the first verses with it. Neither PARC nor Apple are the end all be all of GUI inception/commercialization. In FF/IE, View menu; [Page] Style; “no style”. Thinking back to my ZX81… the Lisa really was a revolution! Isn’t this fairly close to how OS/2 works? Ah, yes. OS/2 had a templates folder where applications could add their own, and you could drag those to another location to create a new empty document of that type which you could then open. Mac OS Classic (6/7/8/9) had Stationery as well. Even OS X lets you create Stationery documents you can use in a similar fashion to the Lisa.